Shrinking your Arduino designs by switching to the Atmel ATtiny microcontrollers is a nice feature if you do not need a lot of pins or want to save space in your design. In this context it is also nice to (mis)use an existing Arduino board (in my case an Arduino Uno revision 3) as an ISP/programming device. A nice tutorial how to achieve this can be found on this, this, and this project page (MIT High-Low Tech Group). I’ve generated a PDF-Version from these three pages for offline reading (and in case their pages move again). 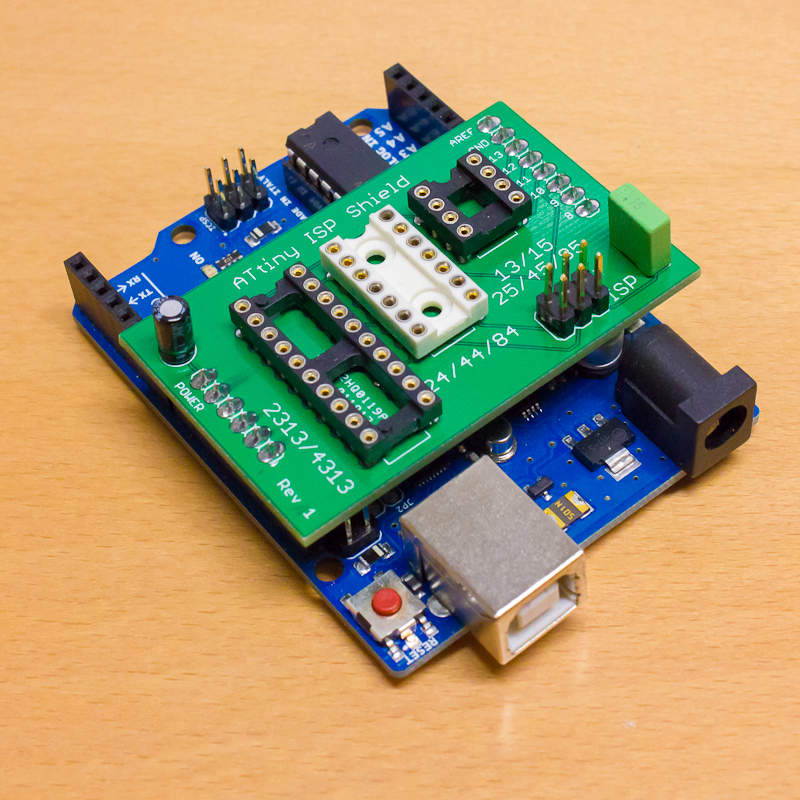 I used the MIT group’s research as a reference for this Arduino shield. It’s always nice to add some extra design… 😉 This is only a small project of mine, but it was already helpful on several occasions. You have to be a bit careful when sticking the shield onto the Arduino Uno as I did not add all (for this purpose unnecessary) pin headers to the shield. The shield can be connected into the wrong pin headers — I added labels to some of the pins for orientation. I was only able to test it on my Arduino Uno revision 3 board, but it should be backward compatible to the previous Uno revisions and the Arduino Duemilanove. Please notify me if you find compatibility issues. 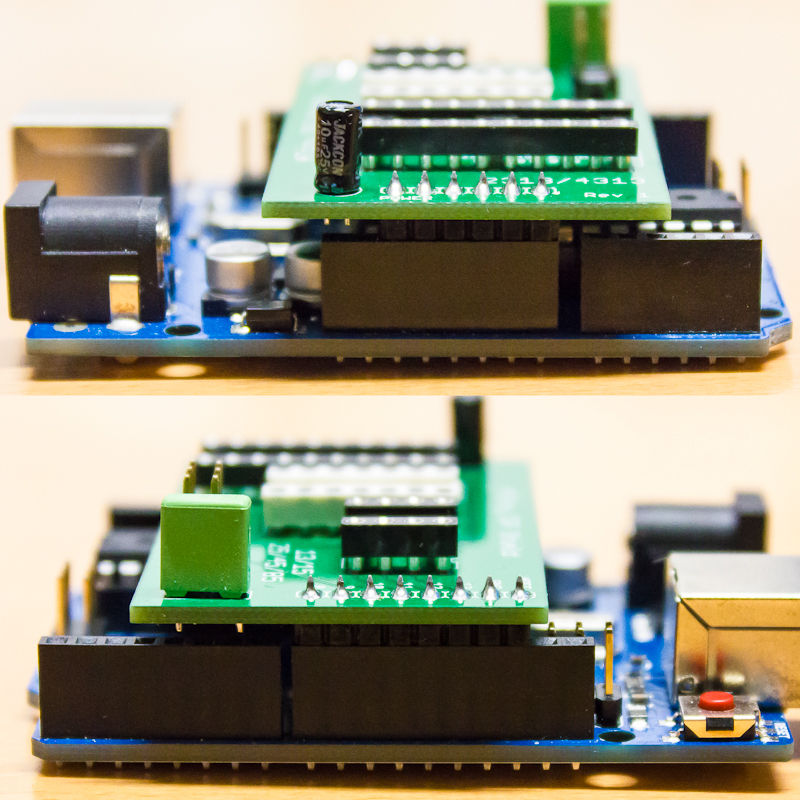 Left and right side of the Arduino ISP shield on an Arduino Uno. Two pins on each side were not added to the shield for backward compatibility. 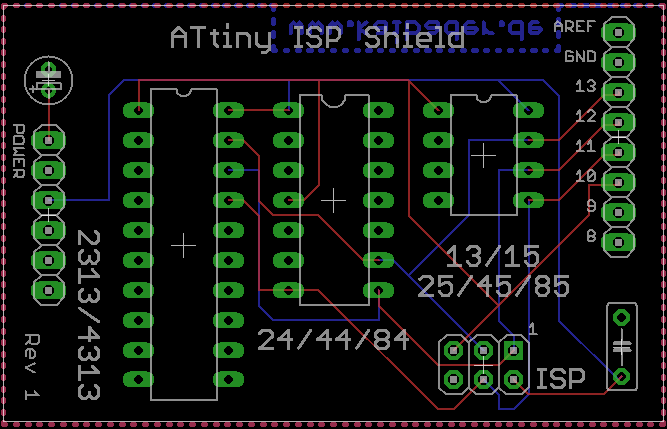 Just in case you’re interested in this little project: The Eagle CAD board file of the ATtiny ISP Arduino Shield is available in my ISP-HVP-Shield Repository on GitHub (CC-BY-SA 3.0 license), and I’ve added the schematics as PDF and as an image below. Keep in mind that they are without any warranty… 😉 I only request you to give me and my site (www.kaibader.de) credits when using it. I still have a few unpopulated PCBs lying around — Two of them are enough for me, so: for a small fee (postage+envelope) I can send you one as long as I still have them. Update: all PCBs are gone now. 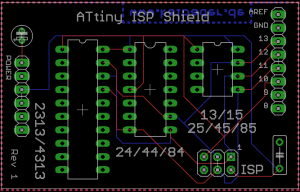 I would like to get one of your ATtiny ISP Arduino Shield Boards if you still have one to sell. If you have let me know how much the shiping is to portugal. I still have a few of the unpopulated ISP shields… I can ship one of them to Portugal for 1,- Euro (uninsured) or 3,- Euro (insured). Just contact me via e-mail if you’re still interested. Any chance of getting one of these shields? 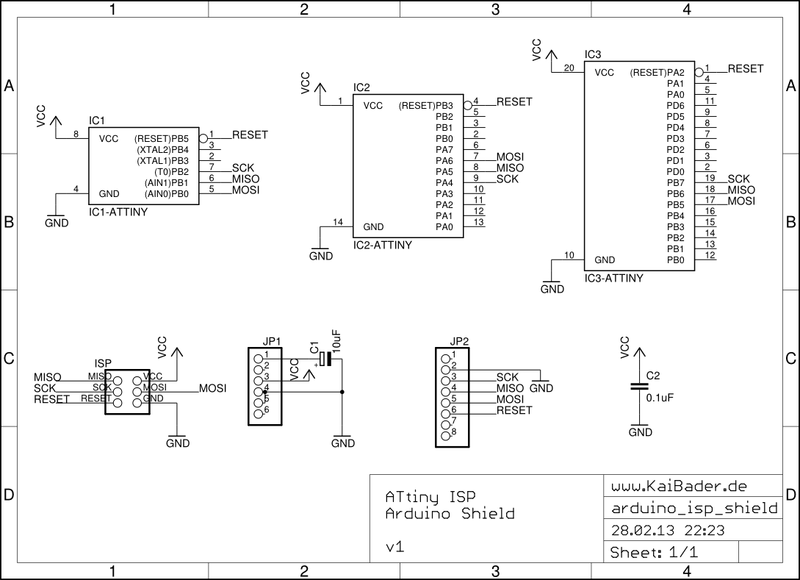 I would like to get one of your ATtiny ISP Arduino Shield. So can you answer on my e-mail what is price and it is impossible pay with pay pal? Nice addition to the MIT High-Low Tech Group Arduino ISP programmer. I’d like to try it with my EvilMadeScience.com ISP Shield v2.0. Should work there as well as with any ISP programmer. yes? I’d like one of the boards in order to build one if they are still available. Sent you an email last night, but no response so far. 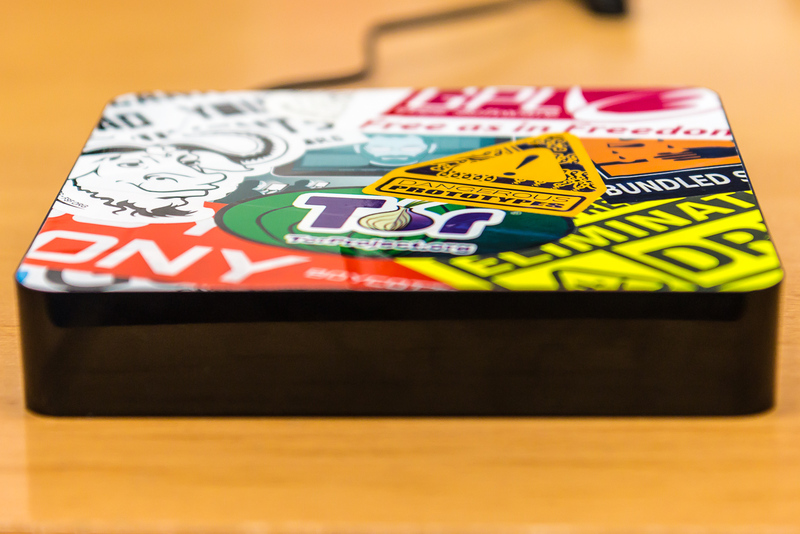 Have you one of this PCB still available? Would you send it to Spain? How much does you ask for it? I’ve received the PCB. Thanks a lot! It is a very nice, simple and useful piece of electronics! Would be great to get 2 (or 3 ?) of these sent to the UK if you have them available. Please let me know, PayPal to registered address OK ? Just finished soldering up (for tiny85 only at the moment) and works great -quicker if I’d not soldered the 6 & 8 pin header to the wrong side first ! I was actually thinking of making of these myself, but you did a fine job yourself. This looks brilliant. I was thinking of wiring up a perf board for some attiny85’s. Any chance you still have a pcb left? If not perhaps you would like to upload your design to a service like batchpcb marketplace etc. so that people can order it from there. Again thanks for sharing this! Can I get one too? I hope you have one left. My homemade one doesnt work. I indeed have a last one left (I had reserved one for someone else who wasn’t interested anymore). I can send it to you if you’re willing to pay for the shipment. Kai. If you are making another batch . I would like to be on your list. Hi Philip, I’m currently not planing to order a second batch. But I’m playing around with a combined ISP and high voltage programmer shield. Currently it only exists as a ‘breadboarded’ version but I think about ordering PCBs if it works as intended. Kai. Hi, I was wondering if you ever made more ATtiny ISP boards? Or if you ever made the combined ISP and high voltage programmer shield you were working on? All of the DIP sockets I see online are the rectangular versions but yours are round holed. What are those called? I just downloaded the BRD file and ordered a set of 3 on oshpark.com. I’ve actually used the ones I had lying around (therefore the two different colors), but as far as I know they are called “precision DIP-sockets”. — Kai. Thanks!! One more thing. I ordered sockets and capacitors from digikey.com, but I can’t tell what kind of capacitors those are in your drawings. I ordered a .1uF Aluminum and a 10uF film cap, but the 10uF is rectangular and waaaay too big. Thank you. I obviously ordered the wrong cap the first time. I’ll order the right one this time. great board! I’m going to try to build one myself, but I’m so new to this kind of things. 1) I see the positives lines in the board, I guess the negative is the entire space around it. 2) the film 0.15uF can be replaced by a standard electrolytic 0.15uF? I just started and I have the basic bad material as I still blow up things. thanks and thanks for sharing this little great board. Thanks for the great board! I looked forever for an “all-in-one” that would program the 85/84/2313 series MCUs! I printed 3 of the boards from Oshpark before I even found your blog (I only found it thanks to your web address on the back of the board!). I’m still a electronics noob so I do have one question: what is the capacitor at C1 for? I ask because I read it wrong and soldered in a 1uF cap instead. It seems to work (I uploaded a blink script to a 2313 without problems) but I can remove the 1uF and replace it with a 10uF easily enough if I need to. I’d like to know how to upload a sketch with a library like manchester o servo8bit using arduino as ISP, could you help me? If u get a compilation error it is no use trying a different way to burn the chip as your code has a problem. could it be your error is about ‘vector 4’?? any chance you could upload the sch file too. I would like to play with it and see if I can make it single sided to mill on my cnc. It might not be possible but I would leave the 2313 out as I don’t think I will ever use that MC. Or, it might be easier to send to my email, thanks. PS if I ever publish a resulting file I will credit you! I opened the BRD file with Eagle and saw that not both pins of the capacitators are connected. Just one is connected. Also there is no GND connection at the ATtiny slot at Pin4, Pin14 and Pin10 (from the little one to the big one). Is it possible to get the SCH file? Is there a newer version of the board available? 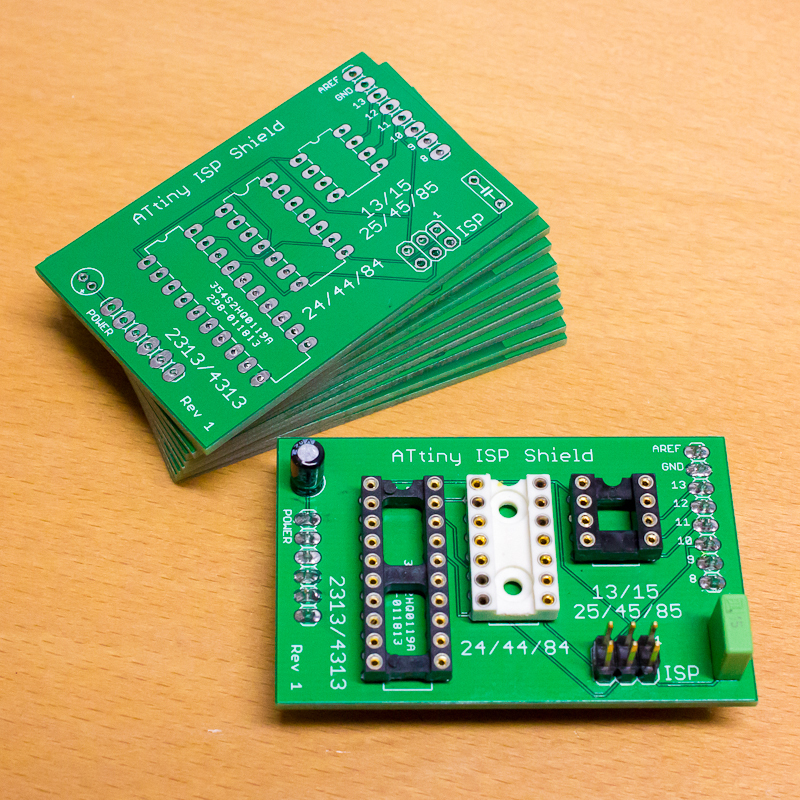 I would like to get two of your ATtiny ISP Arduino Shield Boards if you still have one to sell. Hello Kai, found your site while searching for a programming solution for ATtiny on a Arduino shield. Great page here, I also apprecaite very much the pdf you made of the lowhightech pages. I downloaded the .brd and .sch files and will make a set of ten boards (Elecrow), so if people are interested they may contact me through you. However, I would like to add a LED indicated start or end of prgramming, or a busy signal: how would you propose to add this, and where should the program be altered? PS: you can pm me also on my email. (Contacted Erik via E-Mail.) The respektive files are available in my GitHub Repositories: Sharp-PC-60Pin-Breakout-Board and Sharp-PC-40Pin-Breakout-Board. Have you a PCB disponible ? populated or not. which parts are needed for the V2? Do you have a photo from the soldered version?